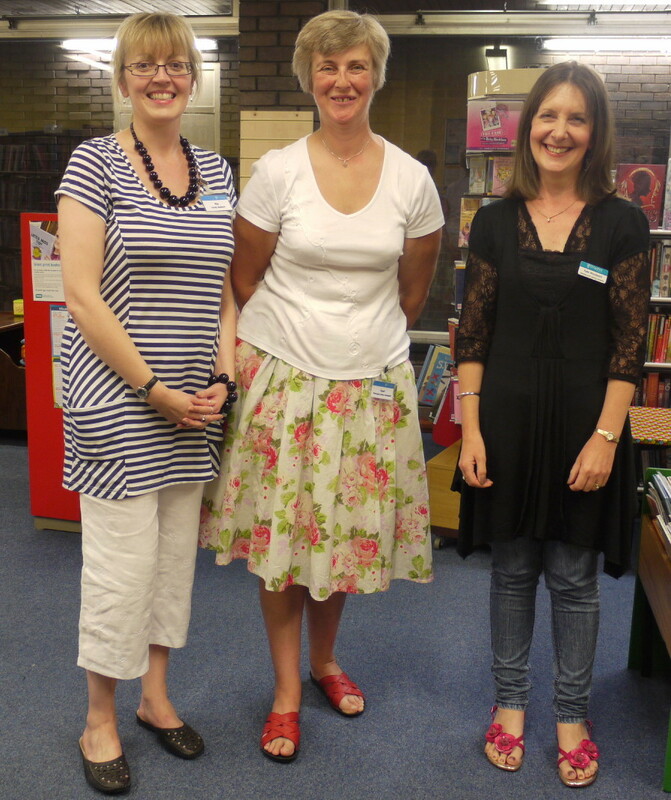 I had a great time in Whitchurch Library tonight. Whitchurch is such a pretty place: narrow ancient streets, a market town, history exuding from every wall, it seems. According to Wikipedia it was founded by the Romans - a settlement in the middle of the plain between Wroxeter and Chester. Then it was called Mediolanum, the 'Whitchurch' came later, named after the White Church (replaced by a red stoned one in the early eighteenth century). The more I read the more interesting this all seems. Unfortunately, I was running late and didn't have time to take a photo, so I am going to have to come back. The librarians had gone to a lot of trouble to attract people to my talk and there was a good audience. I got a lot of interesting questions, and one lady turned out to be a descendent of Michael D Jones's sister (one of the main initiators of the Welsh in Patagonia emigration). 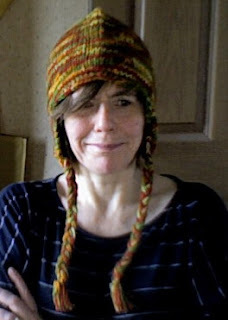 I am sure I have met some of her distant relatives in Patagonia and intend to put her in touch with them. I also discovered almost-a-fan of my work, 'My wife's read your other two books,' he said. (This makes her almost unique, I have to say). 'She liked one, but hated the other.' Excellent. This makes me smile each time I think of it. 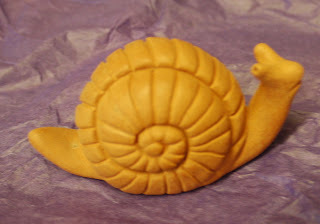 but a sweet little pottery snail too! I shall treasure it. Thank you! And thank you for asking me. The Testament of Jessie Lamb deprived me of sleep. I read most of it in one sitting, then since it was late, went to bed, but then I couldn't get to sleep through thinking about it, so I just had to get up and finish. 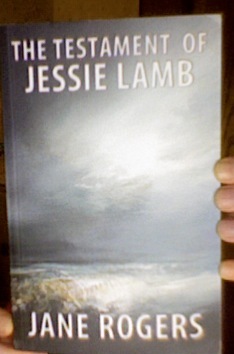 It was worth it because the ending was perfect - open without being unsatisfying - and also rather beautiful. Jane Rogers manages to portray the adolescent I was. I'd forgotten the ideological smugness, and the feeling that I'd make a much better job of things than my parents had managed. I'd forgotten how I'd noticed and thought about the world around me, such as this about people in a crowd: 'It was weird to imagine there was no possibility, ever, of getting to know even one of those strangers'. 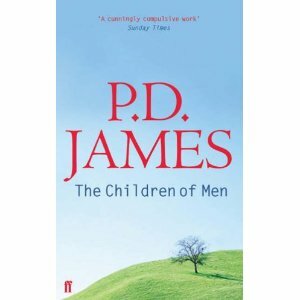 I also liked the fact that the novel is based locally in the northwest of England. 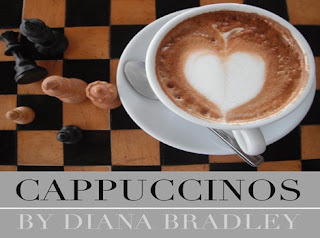 When stations and cafes were mentioned I knew exactly the ones she meant. The narration is suitably simple but convincing. Jessie, the first-person protagonist, is a serious girl, somewhat self-absorbed, and as she considers and comes to a quite unreasonable conclusion about what she must do, I felt as frustrated as her parents. Like them I would have felt desperate enough to imprison her, but such was the skill of the writing that I could see the dilemma through Jessie's eyes too, and could see exactly why she was doing what she was doing. I had just finished listening to Margaret Atwood's 'Onyx and Crake' on audio, and also watched the film version of Kazuo Ishiguro's 'Never Let Me Go' on DVD, and I know this is just a question of taste, but to my mind, certainly in terms of form, 'The Testament of Jessie Lamb' was superior. Jessie Lamb is shorter and so there is less packed in, but this allows greater emphasis on the important point of the novel: the motivations and pivotal moments of the characters. Last Wednesday I was interviewed on Glan Clwyd Hospital radio by Jo Fino. 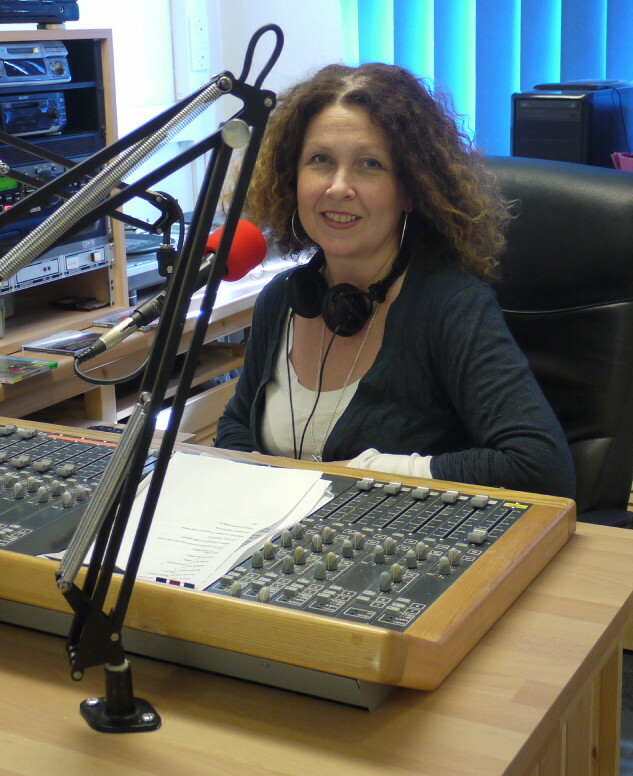 It was a version of 'Desert Island Discs' so I had to select about eight tracks to talk about, and so selected not necessarily my favourite songs, but easy-listening music I thought most people might enjoy, and which also represented my life. Under the Moon of Love - Showwaddywaddy (because one of them lived at the bottom of my garden when I was a child). Fast Car - Tracy Chapman (because I remember listening to this soon after I got married). American Pie - Madonna (because I used to listen to this when driving to work). Me, myself, I - Joan Armatrading (because it seems to me to be about women and their different roles and fist starting to write my first novel alongside doing everything else). Distant Shores - All Saints (exotic places and beaches in Greenland and my first novel for adults about Alfred Greenland). Men of Harlech - Welsh Choir (the Welsh in Patagonia novel research). Nightswimming - REM (current research in China and swimming in the night in a pool in Hong Kong - something I had long wanted to do). Jo, who is a writer too, hasn't been a volunteer at the radio for long, and I was her first interviewee. I thought she did a grand job. I enjoyed myself very much and hope the audience did too. Thanks for asking me Jo! 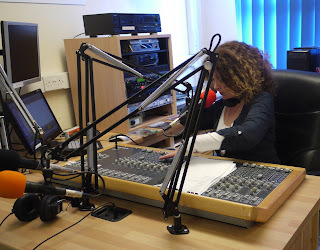 (And thanks to Chris the Radio Manager who manged to find the songs I'd half-remembered). The God Species is an unusual book: a review of the environmental challenges ahead of us that manages to give a balanced and optimistic approach. In God Species he moves on from the general prediction of doom in Six Degrees (reviewed here) to taking a look at what can be done. Some of his conclusions are surprising. His approach is in terms of boundaries. These are limits that scientists have estimated we must not exceed in order to prevent ecological disaster (or, in fact, planetary catastrophe). The first boundary is biodiversity. Mark Lynas says that the 'Anthropocene' (caused by man) Mass Extinction 'and the death toll will soon rival that at the end of the Cretaceous, when the dinosaurs (and of the half the rest of life on earth) disappeared.' The solution is to put a value on ecosystems as places of recreation, clean water and air and bring them into the marketplace. Quite often Mark Lynas advocates using capitalism to solve our problems. As he says, preserving biodiversity makes economic and scientific sense. Once an animal becomes extinct the ecosystem to which it belonged falls apart - usually irretrievably. As well as having dire economic consequences to humans that depend on components of that ecosystem, unique resorces are lost forever. Climate Change is next on the list. In some ways the effect of global warming did not feel quite as catastrophic as in his previous book, although clearly it is something we need to urgently address. He points out that the release of methane hydrates from the ocean and the permafrost of Siberia is not thought to be imminent, for instance. However, his boundary for carbon dioxide concentration is revised downwards from 400ppm to 350ppm. Only with this concentration is the climate likely to stay similar to the one in which human civilisation developed and grew. He says we cannot do this by reducing population (it would have to go down to just one billion) or reducing growth (because most people want and have a right to an improved standard of living). Instead it must be through reducing the carbon emitted by use of nuclear energy and renewables (solar, wind and HEP); and also research and development in these areas as well as cutting down on energy waste. I found the chapter on the nitrogen boundary particularly interesting, despite the slight typographical error at the beginning: elemental nitrogen has triple bonds not double. It described the importance of nitrogen fertiliser, and how this averted a Malthusian disaster at the beginning of the twentieth century. It, more than anything else, has allowed the population of the planet to grow, and so, in a way, is responsible for many of the other ecological problems today. Artificial fertiliser has led to direct problems as it is washed off the land and produces algae blooms in rivers and the sea. This growth deprives water of oxygen and it becomes a dead zone where nothing else grows. Overall the production of artificial nitrogen fertilisers should be reduced to 35 million tonnes a year from 100. Mark Lynas lists some possible solutions: NOx boxes on car exhausts, maintenance of wetlands which foster denitrifying bacteria, removal of nitrogen compounds from sewage, avoiding excessive use of fertilizer, use of nightsoil, improving nitrogen uptake efficiency in crops using genetic engineering (convincing argument for this, and he is a recent convert), getting crops to become leguminous (i.e. fix nitrogen themselves using microbes). The next boundary discussed is that of land use. It is important that land is kept in as close to natural state as possible, otherwise the biosphere is likely to collapse. No more than 15% should be converted to cropland to protect the earth system as a whole. He advocates city living as environmentally friendly as the wilderness areas are then left alone, and tends to decrease population growth. This 'rewilding'of rural areas, he says, is already taking place. In discussing the freshwater boundary he presents some surprising statistics. 60% of the world's largest rivers have been fragmented by man-made structures such as dams, and two large dams a day for the last 50 years. Freshwater is essential for human health and cleanliness and also agriculture. Damming water has provided water irrigation, but at the same time threatens biodiversity, changes local climate, and some rivers, such as the Yellow River in China are closed - with no water flow along some of its stretches at all. This may cause cities built on their deltas to sink. The limit to human consumption of water at 4,000 cubic kilometres a year has not yet been exceeded, but where this water is taken from is important. He recommends that unnecessary dams be removed and rivers serving ecological disaster areas such as the Aral Sea, are restored. This will mean cotton crops in arid regions are abandoned but they are unproductive anyway. Schemes such a China's Three Gorges Dam present more of a conundrum since the ecological and social effects must be balanced against the advantages of a renewable source of electricity. Another surprising conclusion is that he advocates food is grown where water is more plentiful and transported. He is also in favour of water privatisation as a method of controlling water use, and necessary because public companies are not doing a good enough job. The Toxics Boundary includes non-biodegradable plastics which are contaminating each part of the globe including the middle of the Arctic and the Pacific; hormones and molecules that have been found to effect marine and river life; and insecticides do not break down and are concentrated in the food chain, particularly in the Arctic. Chemicals already known to be toxic are already regulated. By 2018 new chemicals are to be tested and registered in the EU, with similar legislation in the US. Radiation toxicity is discounted because in areas where there is high natural radiation the cancer rates are no higher (except in areas where radon is emitted which increases the incidence of lung cancer). Effects of Chernobyl although devastating have turned out to be short-lived and less than feared. With the exodus of humans the ecosystems are flourishing. Listed against mine and oil refinery disasters the number of fatalities in the worst nuclear disasters are small. Dealing of waste is also manageable. He considers the Greens' opposition to nuclear energy has been a big mistake, and may have contributed to global warming. The colour of the sky is now more milky due to aerosols, and these form another boundary. The effect on global warming depends on the sort of aerosol particle and where it is. For instance a white cloud shielding the dark ocean will reflect more light and have a cooling effect, whereas a dark cloud over the poles will warm. Although the effect of aerosols is temporary it can have profound effects: for instance the brown cloud over India has diminished the Monsoon, and the smoke stacks of the northern hemisphere caused drought in Africa. Black carbon is mainly produced by developing countries, and is one of the easiest to address. Filters on diesel cars, scrubbers on ships, modernisation of coal-powered power stations in China and home stoves in India are the main solutions. In order to accomplish the latter he suggests the use of carbon-offset tariffs. As far as sulphur-based aerosols are concerned he describes Nobel-prize winner Professor Crutzen's idea to inject a2-4% of the 55 million tonnes that are produced each year into the upper atmosphere. 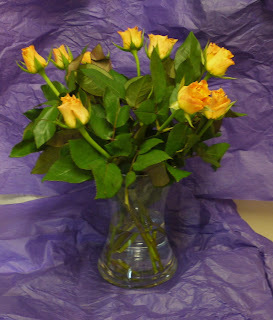 These will reflect sunlight and yield a cooling effect which may temporarily ameliorate the effect of global warming. This is highly controversial. In the geological past, acidification of the oceans (another boundary) caused by increased vulcanism has caused mass extinctions. Although coral seems to have continued to flourish this is thought to be because of the neutralising effect of the the lower levels of the ocean. However, for this to happen there must be mixing, which requires over tens of thousands of years. Humans are producing carbon dioxide an order of magnitude more rapidly than the biggest super-volcanic eruption of the last billion years; the change may be too fast for the oceans to adapt and for life to evolve. The boundary for the preservation of corals and marine life is in terms of the concentration of aragonite (the form of calcium carbonate used by corals to build shells) and this should not dip below 80% of pre-industrial levels. As long as the carbon dioxide level does not rise above 500ppm this should be okay. He argues against Matt Ridley's assertions with regards to ocean acidification in the Rational Optimist, pointing out that a small change in pH is actually a large change in acidity because pH is a logarithmic scale. He tells a very interesting and optimistic story about the hole in the ozone layer (the last boundary) and how politicians led the way in legislating for scientific and hence environmental change. This led to the banning of CFCs in the Montreal agreement of 1988 and consequently the hole in the ozone is now slowly recovering. However in Kyoto 1997 which hoped to do for climate change what the Montreal Protocol had done for the ozone layer there was failure because the USA refused to ratify and it also set the rich and poorer countries against each other. Mark Lynas was actually in the room when the Copenhagen treaty failed to agree targets in 2009, and his account is dramatic and depressing. China was flexing its muscles and establishing its new position in the world. Without China's agreement nothing was possible. However, China is now leading the way in many respects post-Copenhagen. Although its emissions may be rising it leads the world in its investment in low carbon technology, and the US is losing ground. There is a very interesting section discussing why the 'libertarian right' tend to oppose climate change arguments. It is, he believes, because they are forced to 'confront the necessity of of respecting planetary limits'. He is equally dismissive of Green 'dead-end ideology' which advocates the adoption of a wartime rationing to combat climate change. He says that both camps tend to ignore scientific evidence to make their case. He believes that we can keep within the boundary limits even with economic growth, and thinks it is only fair that developing countries achieve the same standards of living as people in the west. He envisages a world economy that enjoys constant growth with lower material use if we recycle and use sustainable energy. 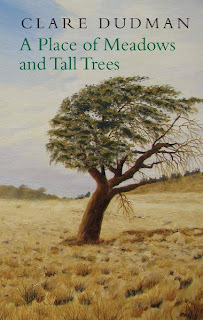 It is a worthwhile book, very well written, bringing together much peer-reviewed scientific information, so that the general reader is brought quickly to speed. I recommend it to anyone interested in a hopeful viewpoint on 'how the planet can survive the age of humans'. This review is also published on Brian Clegg's Popular Science Website. Thanks to Paul Halpern who commented that he was in a Conference on Literature and Science, I duly searched for the terms, and found there was a British version. I am going to sign up for this next week. It seems that this has been going since 2006. Obviously, I am out of the loop. 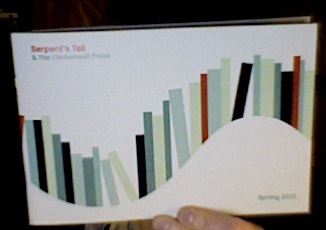 Today cometh the Profile and Serpent's Tail catalogues. I spent a long and happy time looking through the Profile one. It struck me that there was something missing, it took me a little while to put my finger on it: not a single celebrity book. How refreshing! A classy imprint, then, and most of them very interesting. For instance, there is one on The War on Heresy by R.I.Moore. The 'action'in this book is around 1000AD in Europe. It concentrates on the motives of the people involved, their beliefs and why exactly those persecuted were judged to be such a threat. It is a part of history I know little about, and would love to learn more. Related to this, perhaps, is the book on the Cathars: The Friar of Carcassonne by Stephen O'Shea which has the sub-title 'Revolt against the inquisition in the last days of the Cathars'. This is new in paperback. 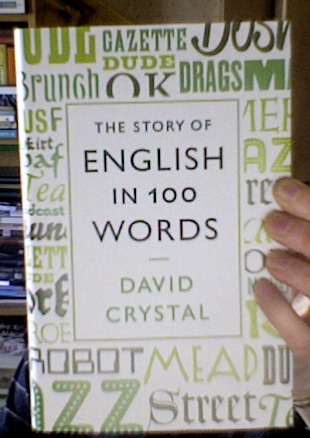 I think my mother may well find this in her Christmas stocking (just so I can borrow it from her). Then there is a book called The Buddhas of Bamiyan by Llewelyn Morgan about the Buddhas carved into the rock in Afghanistan, and destroyed by the Taliban. Ever since reading about this in my Silk Road research, and then listening to the Kite Runner, I have been fascinated by Afghanistan. One day I plan to go there. But there are lots of other books in there too that sound equally interesting: The Origins of Political Order by Francis Fukuyama, for instance, or The New North by Lawrence C Smith on how the world may look in 2050; then there's a book on the future of Africa by Duncan Clarke (an area of the world I know lamentably little about, and really should know more); another on the London Underground by Andrew Martin and then there's one by Daniel L Everett called Language and follows on from his absorbing account of his adventure with the Pirahas, which I read a couple of years ago. 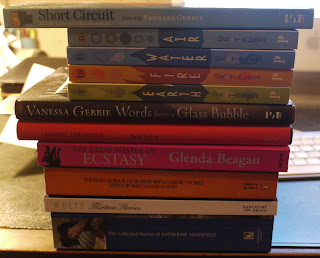 Ah, so many wonderful-sounding books! And that's before I even start on the Serpent's Tail catalogue. I came back from the Society of Authors in Scotland Conference tonight (which was excellent) and just want to post this clever video which was shown to us by Rob McDevitt of Hachette Scotland. 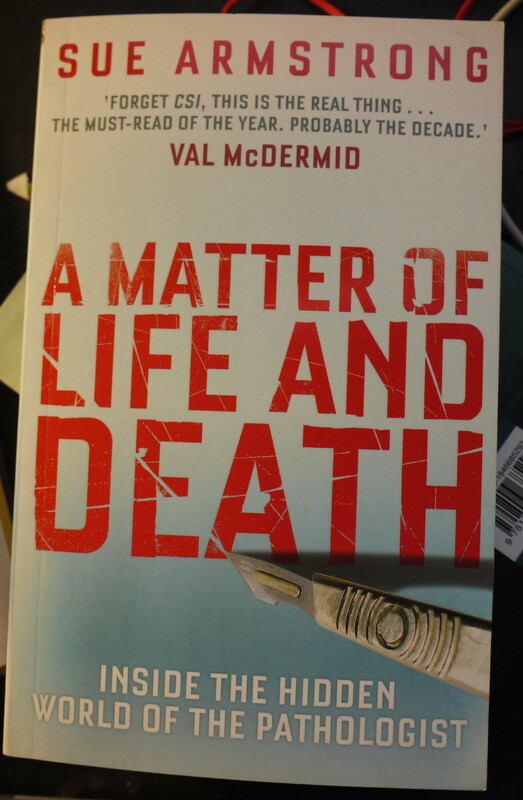 I am going to the Society of Authors Conference in Edinburgh tomorrow. It is strange how often this happens. I never go to a place in my life before, and then find I go to it twice in a year. In May I passed though Edinburgh station, and now I go again. Today I have been trying to do some work, do some chores and am now packing. 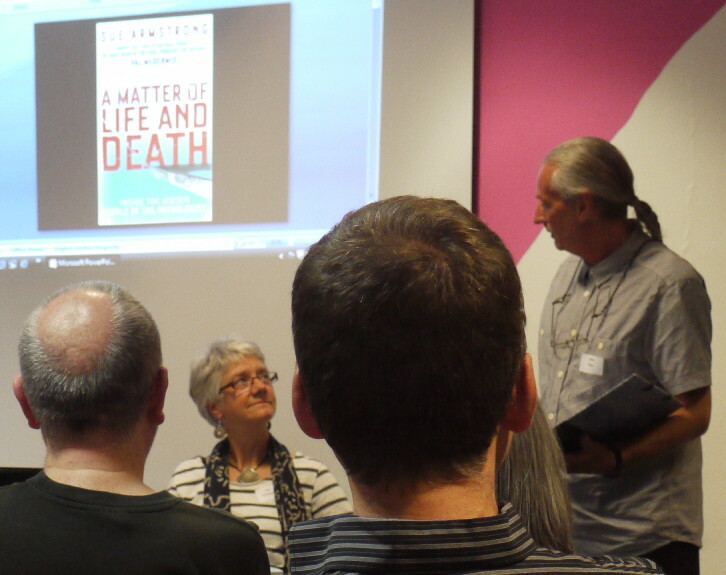 It is all made more complicated by the fact that it is a Chester Writers meeting tonight. I feel rushed because I always leave things until the last minute. 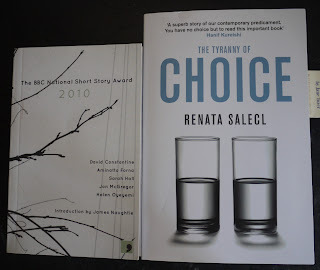 However, as I charge my macbook, iphone and camera I have just time to mention the two books I'm taking: chosen because they are both small and yet will keep me occupied, fiction (BBC National Short Story Award shortlist 2010 edited by James Naughtie) and non-fiction (Choice by Renata Salecl). 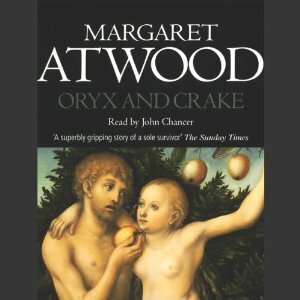 I also have Margaret Atwood's Oryx and Crake on my ipod, so I shall be happily entertained. Today, at 11am, the Society of Authors Tweetathon starts. A well-known author will tweet a line and you are invited to continue the next four sentences. It will finish at 4pm and will be repeated on five consecutive weeks. Full details are here. 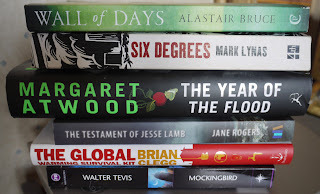 I have decided to take a look at a few short story collections I have had in the pile for some time (having only read a couple of stories from them previously). 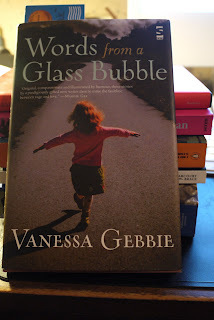 The first one I picked up was Words from a Glass Bubble by Vanessa Gebbie (published by Salt Books). 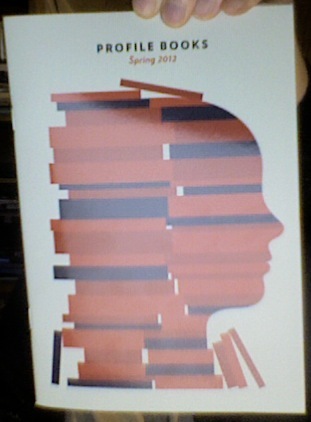 I particularly like the cover of this one and reminds me of the StartRite shoe logo from when I was a child. The stories inside turned out to be just as appealing, with a subtle fantastical feel about them. Several were strongly Welsh, whereas others were set in a run-down English coastal resort. Vanessa Gebbie is particularly good at evoking the voice of the poor, ill-educated and disadvantaged. Inside these pages are drug addicts, orphans, and men and women who have lost something: a child, a lover, a wife, their virginity, and once, most memorably, the entire contents of a digestive tract. Most of the stories have dramatic revelations at the end, and there is something in the style that reminded me of Angela Carter and, once or twice, Dylan Thomas. The pervasive themes are isolation and detachment which lead to the fantastical feel described above. My particular favourites are 'The Cactus Man', 'The Kettle on the Boat' and 'Harry's Catch'. They are intensely moving but without being at all mawkish. 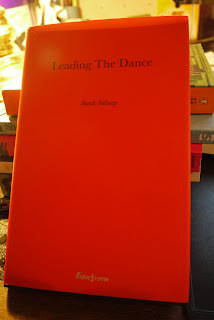 The second one was Leading the Dance by Sarah Salway (published by BlueChrome Books). This is another strong collection. The stories are quirky and witty and hugely enjoyable. I started making a list of the ones I thought were particularly brilliant, but in the end found I'd put down most of them. They tended to be about the fragility of human relationships, and although there are sometimes twists and revelations this is not the main point. I think the reason I found them so addictively readable is that they explore what makes us all human. I suppose the ones I found most memorable are 'The Fabulous Button Sisters' (about infatuation), 'Keeping the Rules' (a particularly convincing inhibited male viewpoint) and 'Leading the Dance' (a subtle study on control) but they were all excellent. Some of the writing reminded me of Alan Bennett's, and some of Anne Tyler's. I highly recommend both collections. This weekend Irene, a tropical storm tempered by its journey over the Atlantic, blew on us with its balmy breath, while in Manchester's Central Station we sipped reminders of summers warmer than our own. In the newly-weds' flat we ate quails' eggs and lambs' lettuce. 'Just because I'm French it doesn't mean I can cook,' Hodmandod Majorette had warned us, but she can, she can! At Crewe, a train was miraculously delayed just long enough for us to leap upon it, and then arriving home, I discover the present of a kind review of my Patagonia novel on my publisher's website. Thank you Sarah Bower. You have understood what I was trying to do exactly - and made what was already a good day even better. At the start of The Global Warming Survival Kit, Brian Clegg describes how off-duty aircraft employees case out the fire escapes in new hotels. I usually just note the plan on the back of the door; but a better thing to do is to actively trace out the route noting the direction, how many doors along, and how exactly you might get out of a strange building that is dark and maybe smoke-filled, and you are groggy with sleep. This idea of preparedness is the main principle of this book. 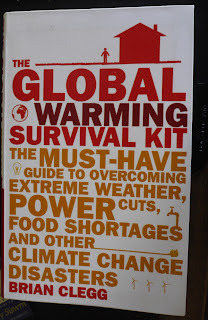 As it says on the back: 'make no mistake, climate change is upon us' and this book is a guide how to cope. The first section is a clearly written summary of what is covered in 'Six Degrees' (how climate change is likely to impact on the earth in the next century or so). The second section leaps straight into the dark: dealing with power cuts, and includes something I'd never thought about before - how to get out of a strange building like an office that is suddenly plunged into darkness. Since power cuts are likely to be a more important feature of life on a warmer planet, Brian Clegg advocates making adjustments for the long term now. For instance he suggests a good investment would be a pedal powered generator that charges up a battery. This could then be used to light in the evening. The third section deals with the basic essentials for life, and keeping cool when there is drought and soaring temperatures around you. When things get hot he advises less talking and less eating since both of these lead to loss of water. The section on food is entertaining. He advocates foraging and recommends how to prepare meals of worms and snails. But foraging like this is an emergency measure. For complete self-subsistence an average family requires at least five acres of land with two people farming it as a full-time job. Since there are likely to be extremes in weather as the world heats, there is a section on this too, including advice on house purchase (location and structure) and how to cope with natural emergencies such as being caught in wildfire. He points out that reality is often very different from the lore of the movies. For instance in a wildfire it may be safer to stay inside a car rather than run for it, as fuel tanks of cars are less likely to explode than is commonly represented. After attack from the weather comes attack from animals and humans. The advice there is to keep as low a profile as possible. Weapons should be avoided since they can so easily be used against you, and the best policy if a building is under attack to try to escape as inconspicuously and as safely as possible - from the ground floor rather than making any death-defying leaps from one building to the next. They are likely to be unsuccessful. The final chapter is unexpected, but equally interesting. This is on the psychological effects of stress incurred by climate change. Brian Clegg, who is an expert on creativity advotaes the following: build up self-esteem, foster a spirit of optimism, exercise, establish a ritual, and list the anchors that you can depend upon when everything is changing around you. In a powerless world the art of story telling and various other forms of art and creativity will become more important than ever to our psychological well-being, and reassuringly, a library of print books is likely to come into its own. Complete with essential checklists at the end of each section, and sturdy water-resistant covers, this book seems to be a great little resource for the possible years ahead, and one I intend to keep handy. Today I was interviewed by Diana Bradley who is taking a PhD in Creative Writing at Manchester Metropolitan University. 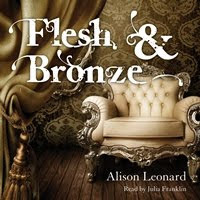 I was interested to hear about how she, and a few other alumni from the Manchester Met MA in Creative Writing (Alison Leonard and Judy Franklin), are having their work first published by Audible. and Judy Franklin's book after their launch in October. 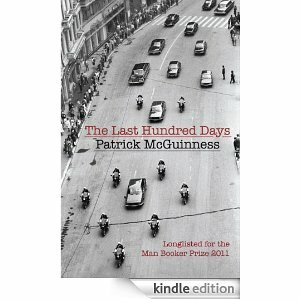 I finished The Last Thousand Days by Patrick McGuinness on Monday night, but have read little since. It is the sort of book that is so powerful that I feel I need a gap between it and what comes next; a space to think and let my thoughts settle before I embarked on anything else. 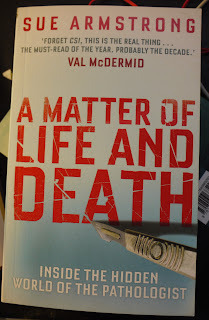 The last half of the book turned into a thriller, with everyone in the pocket of everyone else, and there was an overwhelming sense of things falling apart. I found it unsettling, and I kept comparing what happened in Romania in 1989 with what happened in London in 2011. One of the ways the people of Romania first made their views felt was by rioting. They were looting too, but out of desperation rather than greed. The reaction of the police was key, and this was how what happened in Romania was different from what happened in London: in some places the police tried to stop it, in others they looked the other way, and in yet others they joined in. I suppose this was the most obvious sign that law and order had truly broken down. I learnt a lot, and I felt that the soulless and constant struggle for life in this depressing and austere place came over very well. The love stories and deceptions were convincing, and all the more devastating for that. It ties in with some of what I've read in Six Degrees. Mark Lynas envisions a time when habitable land is diminished and there are climate refugees no longer able to coax any sort of sustenance from the parched soil. He envisions wars, and struggles for territory. I suppose things could be as bad, if not worse, than Communist Romania. Nothing is available. People struggle every day to survive, and they blame - not the people in charge, but the profligate people that went before. That is, us. Having read all that, it seems sensible to continue my reading with another non-fiction book: The Global Warming Survival Kit by Brian Clegg. I hope it will suggest a way of coping with what now feels like an impending catastrophe. 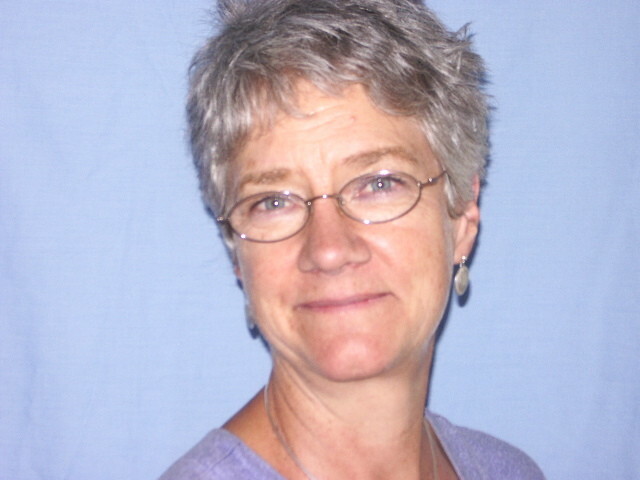 I am delighted to report that Debra Hamel (scholar of Ancient Greek and writer) has some exciting news about a forthcoming publication on her blog: a new take on the original unreliable narrator: Herodotus. It is to be called Reading Herodotus: A Guided Tour through the Wild Boars, Dancing Suitors, and Crazy Tyrants of The History and is published by Johns Hopkins Press. An excellent title, methinks, and I have a feeling this is going to be a fascinating and highly entertaining read too. has been optioned by the actor Cai O'Leary. Many thanks to Kate Pool at the Society of Authors for help and advice. Back in the eighties, when I was studying for my PhD in chemistry, any chemistry paper that came out of Romania has Elana Ceausescu as chief scientist. The woman must have been the world's most industrious scientist. She wasn't, of course, and reading Patrick McGuinness's The Last Thousand Days gives a fascinating insight into the regime that fostered such dishonesty. 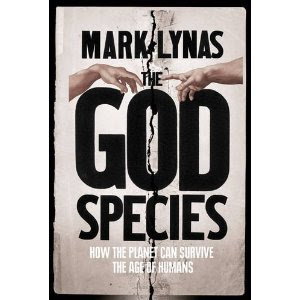 and Mark Lynas's recently published The God Species on order (having been impressed by his Six Degrees). I like to read fiction then non-fiction because I think it works different parts of my brain - rather like wearing high-heels and then flats to exercise the feet. 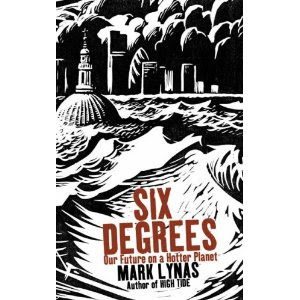 I've just finished reading Six Degrees by Mark Lynas. Apart from feeling thoroughly depressed as a result, I am, after digesting the final chapter, determined to cut down my carbon consumption. I suppose a start would be to do what Ian Hopkinson has done: and utilise greener energy sources. As the book says, it is more important than anything else. Mark Lynas realised that since he lived near Oxford, he had access to a wealth of information about global warming in the Bodlean Library. He decided to go through all the peer-reviewed literature on the subject, and summarise what scientists have determined would be the possible effects of a one degree rise in average global temperature, and then a two degree rise and so on up to a six degree rise. The first degree rise is inevitable, he says. This will mean we will have fewer species of life sharing the planet. Atolls and other low lying land will disappear, and some of the temperate and tropical mountains will lose their ice. Hurricanes will become more widespread. At two degrees there is further loss of land from low-lying areas as the oceans rise - including a large number of coastal cities. Loss of ice from South American glaciers and snowpack will mean drought along the western side of the Americas. There will also be increased incidence of lethal heatwaves - as in Paris 2003 when 210,000 people died. The biggest effect will be felt in India as agricultural production will diminish, and the monsoon strengthens and there will be increased flooding. Mark Lynas surmises that 2 degrees will be survivable, albeit with loss of biodiversity. It is at three degrees that things get bad. Using the model set by fossil evidence from the Pliocene, he predicts superhurricanes with faster, more powerful winds, serious fertility and drought problems in the west of the US, while the eastern seaboard floods. In Europe too, the frequency and intensity of storms will increase, while south of the Alps there will be desertification. The main rivers in Asia (e.g Ganges and the Yangtze) initially flood but then diminish as the Himalayas lose ice. Crop yields start to decline in the tropics due to heat which will bring widespread starvation, so the crop range will shift towards the poles. This will lead to climate refugees and a new philosophy of blame. Perhaps the most catastrophic thing of all is that at three degrees there could be positive feedback, particularly in places like the Amazon. The forest will produce more carbon dioxide as it becomes warmer which will lead to greater temperature rises, drought, wild fires and eventually desertification of the whole basin. The picture he draws even at three degrees temperature rise is terrifying. At four, five and six degrees the situation becomes worse. The world is subjected to alternate flood and drought, and as the temperature rises more positive feedback comes into play. At four degrees, stored methane is released from the tundra, which is an even worse greenhouse gas, at five degrees methane hydrate is released explosively from subsea continental shelves causing Tsunamis, and at six degrees even oceanic carbon fixers are dead and there is runaway warming. In each case there is palaeoclimatic evidence from rock strata. The six degree model comes from the mass extinction at the end of the Permian 251 million years ago when 95% of the species on the world were wiped out. 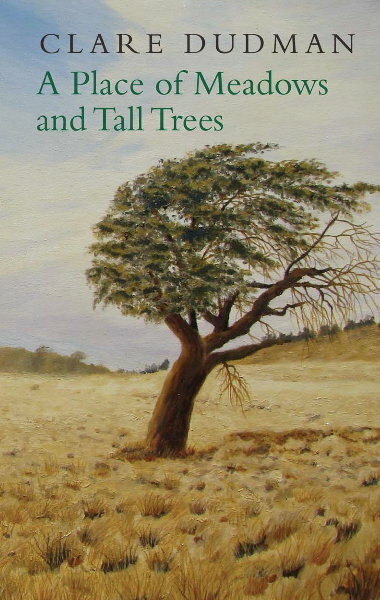 Mark Lynas describes each scenario very vividly, with some sequences read like a thriller, and I have a feeling that Mark Lynas enjoyed writing this book, despite its serious and dismal message. 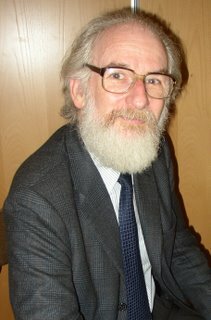 At the end he says that it is essential that warming is halted at 2 degrees, and for this to happen green house emissions must peak within the next eight years (2015). After that they must decline by 90% by 2050. In order to achieve this he suggests a 'contraction and convergence' agreement so that everyone on the planet has the same emission per person. Practically, this means halving the distance people drive, increasing fuel economy, increasing fuel efficiency and generally living less consumptive lifestyles. I suppose each one of us needs to look at our lives and see what we can do. However, I think little is going to be achieved unless the government helps, because without their incentive, most of us are going to sit back and do nothing. I was given this book by an environmentalist in Perth. Since discovering the stats tab at the top of blogger a few weeks ago I have had hours of amusement discovering how people arrive on my blog. This morning I discovered that someone had arrived here after using the words in the title of this post. Where was the mattress, I wonder. Who turned it over or pulled back the sheet? Who reeled back? Did they make a sound or did they more quietly draw in air past their teeth? Was it a maid at a guest house, or a run-down hotel, or a guest? Or was it an industrialist with secrets at some smarter establishment, and those striped worms with legs are the sort that crawl under your skin into your mind, sucking up thoughts and replacing them with a set of irresistible impulses: 'pick up the phone, tap in this number, and tell the woman who answers all that you know'. It's such a good thing he found them first and was able to google himself an answer and it is this: Get out now. Run for your life.